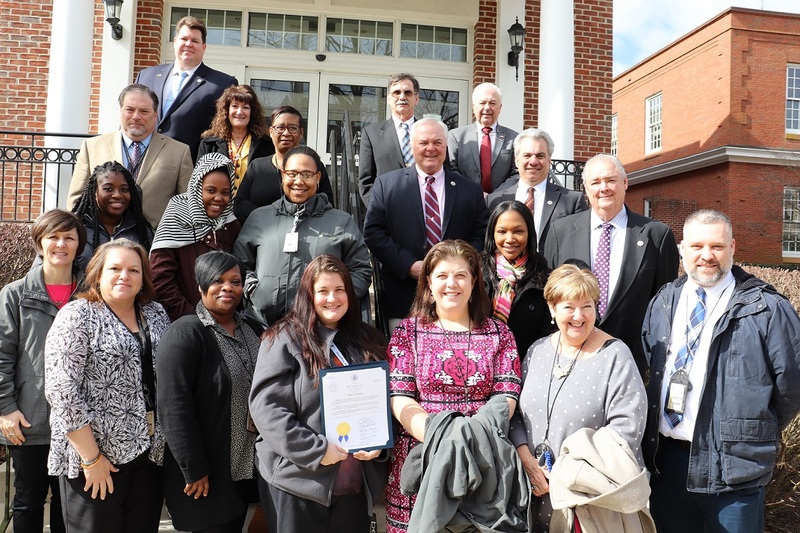 Tuesday, March 5, 2019, the Commissioners present a proclamation recognizing March as National Social Work Month to Department of Social Services (DSS) professionals striving to improve lives locally. The Commissioners recognize the contributions DSS professionals make each day that enhance the well-being and meet the basic needs of all people, especially the vulnerable, oppressed, and impoverished and that elevate and empower people to solve problems, to cope with personal roadblocks, and to obtain needed resources. Those pictured include Dawn Blades (front row, from left), Tammy Jones, Terry Whitney, Kimberly Linton, Jamie Manning, Terry Edwards, and Brandon Riggin; and Latosha Harmon (second row, from left), Ashley Collins, Althenia Jolley, Trina Townsend, and Commissioner Mitrecic; Kevin Schablein (third row, from left), Meg Marcarelli, Felicia Northan, and Commissioners Jim Bunting and Chip Bertino; and Commissioners Josh Nordstrom (fourth row, from left), Ted Elder, and Bud Church.